Serving as a blueprint for manufacturing transformation, SAP offers a Perfect Plant Framework by integrating planning, asset management, and execution with real-time visibility. HAI*QPM is a simple, yet powerful, system enabling companies to create quick wins with real-time production- and quality information, while keeping aligned with long-term SAP architecture strategies.HAI*QPM is based on SAP NetWeaver Java Web Application Server, providing a web based environment that runs on the SAP technology platform, yet kept aside of the main ERP system, as separate software. 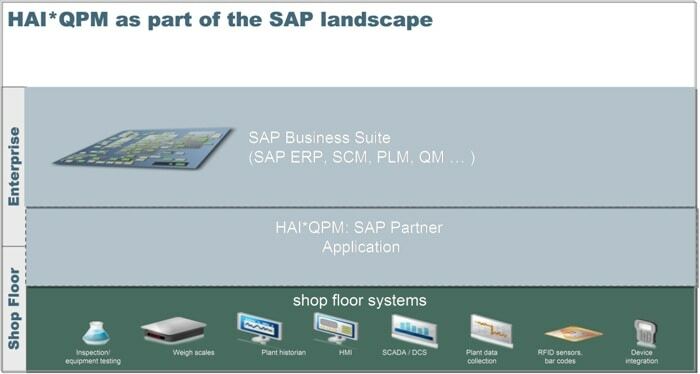 Although HAI*QPM is designed to operate as part of the SAP landscape, you may decide to run HAI*QPM independently. Alternatively, you can link your enterprise processes and master data with manufacturing processes to run your business based on a single version of the truth: creating the visibility, responsiveness, and performance you need to be succesful.